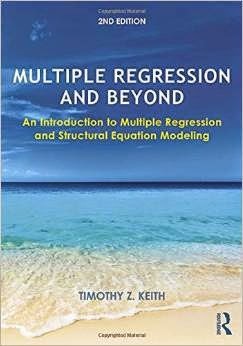 I was pleased to learn that one of the most respected quantoids I know has revised his classic book, Multiple Regression and Beyond: An Introduction to Multiple Regression and Structural Equation Modeling. Dr. Keith's quantitative skills are top notch. He is one of three quantoids I consult when I need advice. Tim has an uncanny talent for making statistical concepts understandable. Two big thumbs up for Tim's new edition. Additional information (including link to Amazon) can be found at his web page.